As of September 30, 2007, the IRS had $282-billion of unpaid assessments on its books. Of that amount $58-billion, over 20 percent, represents the unpaid payroll taxes due from employers. The majority of payroll taxes due from employers results from income and social security taxes collected by the employer and held in trust for the government. Internal Revenue Code section 6672 ("6672") gives the government the right to pierce the corporate veil to pursue collection of these payroll taxes. Because it creates personal liability, 6672 can serve as a powerful tool in the fight against the growing tax gap. Unfortunately, 6672 is flawed in the way it operates due to its position in the Code as an assessable penalty. The interest charged under 6672 only runs from the date of the actual assessment against the individual and does not relate back to the due date of the corporate employment tax return. The flaw allows those responsible for failing to pay over payroll, and other, taxes collected for the government to avoid paying interest for two years or more. Additionally, the flaw provides an incentive for those responsible to withhold payment and delay assessment. 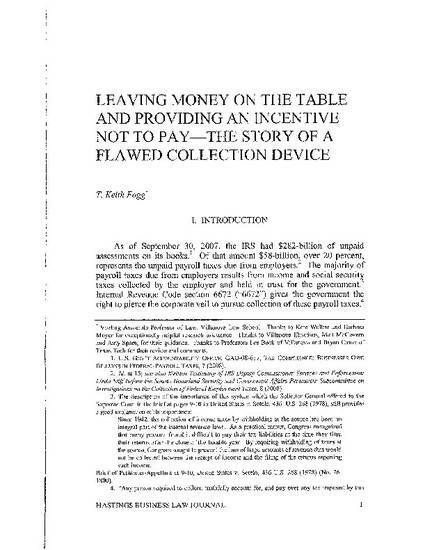 Those studying the causes of the IRS tax collection gap uniformly identify the creation of incentives to pay and removal of delayed collection attempts as keys to successful collection and reduction of the gap. Using the model provided by the tax gap literature, this paper identifies the source of the problem with 6672 and recommends a solution. The solution is to remove 6672 from the assessable penalty provisions and make clear in the statute that interest charges against the individuals responsible accrue from the due date of the corporate return. To set the scene, the article explains the operation of 6672. Following that explanation, it explores the purpose of 6672 focusing on its legislative history, Congressional policy, IRS policy, and decisional law. Finally, the specific problem of the treatment of interest under 6672 is addressed by examining the mechanics of the interest provisions, the misalignment with similar statutes and the problems created for the IRS by the current statute.